We distribute Vacuum Jacketed Pipe, (Vacuum Insulated Pipe) for Midwest Cryogenics in both New Zealand and Australia. Our pipe is designed and manufactured in the USA to the ASME B31.3 Code for Process Piping, ensuring the quality & longevity you need to realise a solid return-on-investment. The biggest problem in transferring cryogenic liquids is loss of product due to heat transfer. With VJP, the vacuum and insulation effectively prevent heat transfer caused from conduction, convection, or radiation. Of all the piping options available to you, VJP is best suited to mimimise heat transfer and lower boil-off. VJP multi-layer insulation is demonstrably superior to conventional foam insulated piping. In fact, it’s up to 40 times more effective in reducing heat leaks. Midwest Cryogenics provides stainless steel super-insulated Vacuum Jacketed Piping (VJP) systems used for the transfer of liquid nitrogen, oxygen, argon, carbon dioxide, and helium. Each VJP system is custom designed to meet the requirements of the application, while keeping the system economics within budget. Midwest Cryogenics uses stainless steel pipe in the manufacturing of its Vacuum Jacketed Pipe. VJP contains an inner line for the transfer of cryogenic liquids with an outer vacuum jacket. The vacuum annular space consists of a multi-layered insulation with an extremely low vacuum level of 9 microns or less. VJP is fifty times more effective than conventional foaminsulated copper in preventing heat leak to the inner line, and VJP is extremely long lasting. 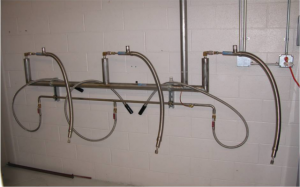 Midwest Cryogenics builds the VJP to ASME B31.3 Code for Process Piping. Midwest Cryogenics prefers the use of inner line expansion joints. With the use of stainless steel inner expansion joints, the pipe supports for our VJP need not compensate for the thermal expansion of the inner line (3.86 in/100 ft for LN2). For lengths of jacketed pipe over forty feet in length, it is necessary to divide the pipe into individual spool sections. We offer two options: either a bayonet joint, or a field joint coupling. A bayonet is a mechanical joint used for lines that can be dismantled and reassembled easily while maintaining a low heat in-leak at the joint. These close-tolerance bayonets consist of a male bayonet that couples with the female bayonet using a silicon o-ring to create a seal, therefore no liquid will flow past the seal. The flanges are held in place by a quick release Vband clamp. The other type of connection, field joint coupling is vacuum insulated. This joint begins with a welded coupling between the spools that is then wrapped with our superinsulation and then evacuated to our standard vacuum level. The assembly consists of an outer sleeve that is field welded to collars that are attached to the VJP spools on either side. Midwest Cryogenics provides VJP with inner pipe sizes ranging from ½” to 8″ and larger for rigid pipe, and ½” to 6″ for flexible pipe. When determining the configuration for your piping layout, remember the constraints imposed by shipping (7½” x 7½” x 40′) and installation; one must consider these factors when designing spool lengths for fabrication. Determine basic routing of the nitrogen system, such as bulk tank location, equipment location, and piping elevation. Provide an isometric sketch to clarify piping configuration. We will then provide isometric drawings with dimensions for your verification. Size the pipe and components based on current flow rates while providing for future expansion. Identify liquid demands to help Midwest Cryogenics determine the components needed to maximize your piping system’s efficiency. Highlight any installation points of interest such as wall penetrations, close quarters, existing fixtures, dropped ceilings, etc. Determine any installation restrictions for length with regards to access for pipe and assembly. Midwest Cryogenics can provide turnkey packages to avoid customer drawing or flow calculation errors. The table provided below details our standard rigid pipe sizes and it’s associated losses. The following example is based on a service of liquid nitrogen running through 200 feet of 1″ x 3″ of Midwest Cryogenics’ VJP with bayonet joint versus foam insulated 1″ pipe. Operating parameters of 24 hours/day and 365 days/year are used to indicate a system with a Keep Full unit installed. The cost per pound of liquid nitrogen may vary considerable based on market changes. Consult your gas supplier for current costs. For this example, the following price was used ($0.04/lb=$0.29/100SCF). These calculations do not included cooled down losses. These calculations are used to demonstrate the relative efficiency of VJP versus foamed copper piping, not to predict actual system losses. Actual system losses include a number of variables represented by these calculations. A bayonet is a mechanical connection between two sections of VJP that eliminates the need for any welded connections. The bayonet is a low heat in-leak device with telescoping male and female components. Due to a close tolerance design, our “low-profile” bayonets utilize a metal-tometal in-line seal with a silicone O-ring placed between the flanges. This combines to make a reliable, heavy-duty cryogenic seal between the two VJP sections, and simultaneously preserves the low-heat inleak of the system. For more information about our VJP please contact us today.